The chamber has diversified over the years, providing a platform for all kinds of businesses and institutions. According to Maria, this is the main reason she has been so dedicated for the past ten years. For more information on the Council nominations process and timeline, please follow this link. If you’re interested but want to know more about being a Council member, or standing for President, contact Glenn for an informal discussion. Nomination forms must be filled in and sent to glenn@britishchamber.be by 24 April 2015. My relationship with the chamber started 10 years ago when I first set up my company in 2005. 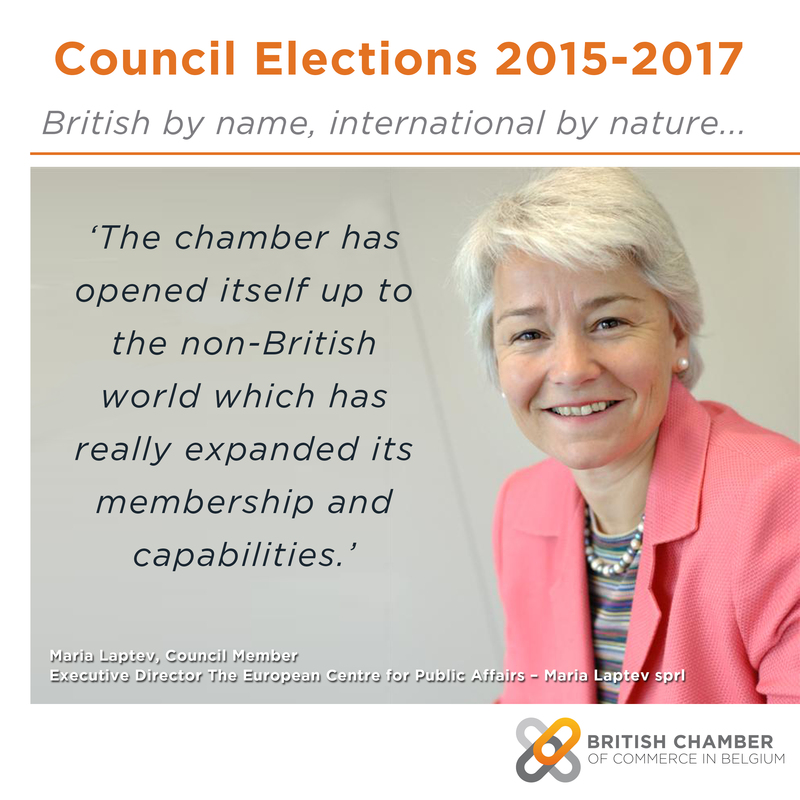 I used to be involved with other chambers in Brussels but found common ground with the British Chamber as it was the only place that welcomed small enterprises and entrepreneurs. The chamber struck the balance between large corporations and small businesses. When we were all gathered well that around the same table, there was no preference. Everyone was treated as equal, which is difficult to find. The chamber also offers new businesses great connections and is the place to link up with other people in the business world. I became involved in the membership committee because I knew that this would be the one with the most impact. I believe that you only get out the best out of an organisation such as the British Chamber if you apply yourself and involve yourself. The chamber has progressed in many ways throughout my time here. It has opened itself up to the non-British world which has really expanded its membership and capabilities. This has allowed the chamber to broaden its offering; whether that’s to young people and the BNG; or to SMEs with the new business trainings programme. The greatest offering and the biggest progression that the chamber has made is the EU Committee. It has given the non-American world some high-level connections to leading policy makers which we never had access to before. It is also important for me to point out that the British Chamber of Commerce in Belgium is also investing time into its commercial part – it is helping companies and organisations to grow in Belgium and beyond. For example, for the past six months, I have been working on the Business Trainings programme which offers companies half-day trainings in a wide-range of skills necessary for a successful company. By working on something that I am interested in, working on an event from scratch and knowing that it will have great value for its members, has made my time on Council worthwhile and appreciated. Back when I first joined, I didn’t have the clout that I wanted to make a difference to the chamber as I wasn’t on the Council and was relatively new to the chamber. However, now I am in the position to make an impact and am doing so by offering something which no other chamber does. As a member of the Council, and now understanding the impact I can have on such an organisation by applying my own skills and experience, I believe that we can really do a lot more. Every board member should have a role and be committed to something which makes the chamber more attractive to potential members and creating something which adds more value to its members. We should be held accountable to all of Council and be able to go into our quarterly meetings prepared and, as I am, rather excited to announce what I have been doing for the past six months. In my next application to be elected to Council, I can reflect on my past two years and know that what I have done has made a difference and I hope to continue that in the next term.